It’s the waiting that follows after you receive word. Currently I have five short stories hanging out in limbo. A couple are on their first submission, while others have been steadily making the rounds to this magazine or that anthology. One of the recently written ones I’m particularly anxious about, as I think it’s a good fit for the anthology I submitted it to. But, I’m sure it’s up against others that are equally good, if not better. So, we shall see. It’s easy to get something written, fire it off, and then just sit on your laurels, twiddling your thumbs and waiting for word when you really should be working on the next story to submit, and then the next. Yet, in the past I’ve fallen into that trap of getting so caught up with the act of submitting something that I don’t do anything else. I focus on my day job, I piddle away my writing time with reading or brainstorming, but no actual outlining or writing. No real forward momentum at all. I thought I had broken that habit a few years ago, and then I wrote a piece and submitted it to a big publisher for an anthology. A few months after that I received word that the publisher was very interested in the story and they were holding it for consideration. I thought, “Oh, wow, this is it!” And even though they said it would be some time before they would get back to me, I settled in and decided to wait. After a few months I realized it was going to be a bit longer than I had originally anticipated, so I arose from my stupor and stumbled back to the writer’s desk, but that eagerness still clung to me like a limpet mine from a VUX Intruder in Star Control 2. I spent more time brainstorming sequel ideas for an as-yet homeless story, and a way to expand that short story into a full length novel, or at least an episode in a greater work. And none of those are bad things in and of themselves, but I let it… if not paralyze me, then at least slow me down and keep me from doing the things that really mattered. Namely, writing new stories. Maybe you don’t have this problem. Maybe you get something written, polish it up a little bit, then fire it off and get on to the next work. That’s the better way to be. That’s the way I strive for daily. It’s very easy for me to get dragged down by whatever is going on during a given day, and waiting with bated breath for word on a story I have out there is one such temptation. I’ve gotten better about letting the anticipation spur me on to write more, but it’s still a struggle. A word of warning, fair traveler: by reading Jeff Wheeler’s “The Queen’s Poisoner,” you are embarking on an adventure spanning six main novels and even a tie-in or two. That said, they’re totally worth it. Over the next several weeks I’ll review all of them, but it makes sense to start with the first. 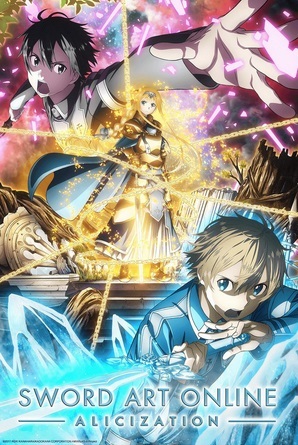 Set in a world where the source of magical and divine power – the Fountain – resides among and amidst its many peoples, young Owen Kiskaddon finds himself at the center of a power struggle in the kingdom. During a battle in the opening chapter, Owen’s father, Duke Kiskaddon, fails to protect his liege, King Severn, at a critical moment. The Duke thought the King would fall, but the King did not. As a result, Owen’s oldest brother was killed and he was taken as a hostage back to the court at Kingfountain, to insure Duke Kiskaddon’s continued loyalty. The story follows Owen’s adventures and misadventures while at the King’s court, and of attempts to pull him deeper into a conspiracy involving many influential members of the land. The story flows very well, and we’re introduced to many different characters in the process. 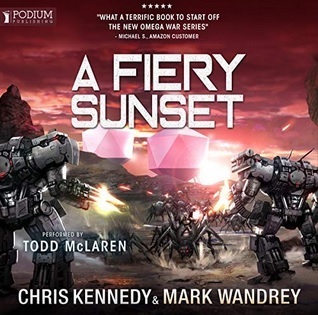 There was a time in the very beginning that I was worried Owen was going to be some sort of a Mary Sue, with the way everyone but the King and one of his attendants seemed to be glomming on to him, but looking back it made a sort of sense why certain characters fell for him the way they did. A young, scared boy all alone, and the characters who attached themselves to him were all parents. And Owen definitely has his faults that land him in a lot of trouble. His arc is well developed throughout, and the pacing is such that I had a hard time turning it off. If you enjoy exploring fantasy universes and don’t mind a younger protagonist, you can’t go wrong with “The Queen’s Poisoner.” Oh, and spoiler alert: Owen does get older as the books progress. He’s only eight in the first one. The second one is more coming-of-age, and the third… Well, I’ll leave that for future reviews. Or you could pick it up and find out! I realize with my last review I forgot to mention anything about the narrator, so I’m making doubly sure to do that here. Kate Rudd narrates all of the Kingfountain books, and her performance is exceptional. I don’t know how she manages a different voice for every character the way she does, but I never had a problem telling who was who, either because she spoke with a different accent or pitch to her voice, or because she changed up the cadence in such a way that it brought the character to life. I was first introduced to her in Melissa F. Olson’s “Boundary Crossed,” and I’ve got a bunch of Kate’s narrations singled out for future listens. If I indie-publish anything and there’s demand for an audio version, she’s one of the ones I want to call. All in all, loved it! I plan to listen to it again, maybe with my wife. I think she’d enjoy the series, especially a couple of the characters who get added a bit later. Love Warhammer 40000? Love to write? Why not combine the two? Nevermind Valentine’s Day. Let’s talk about first loves with books. 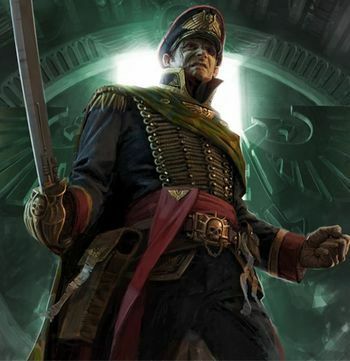 I first fell in love with Warhammer 40000 way back in 2008, when Borders was still around. There was one right next to the office I worked in, and I’d spend more lunch breaks than I care to admit in the bookstore, browsing and trying to figure out what to read on my commute back home. I’m normally into fantasy, so you’d think my first foray would be a rousing, sword-slinging tale of Sigmar’s Empire and its eternal fight against Chaos, but no. The first one I picked up was the first Gaunt’s Ghosts Omnibus, “The Founding” by Dan Abnett. I burned through the first few chapters in my short lunch break, then bought it and spent the next several days reading it to and from work. Then I grabbed the next one, then it was on to the more recent ones that hadn’t been combined yet, and so on until I’d read them all and needed more Warhammer. At that point I didn’t care if it was fantasy or sci-fi; I just wanted more Warhammer. That’s a really long lead-in to the subject of tonight’s post: the Black Library (Publisher of Warhammer fiction) is doing another open submissions period where they seek short story proposals from new authors. Back when I first started reading and submitting it was done more like a short story contest, where you’d be given some sort of premise, you’d submit, and there would be winners and honorable mentions. Now it’s done more like a magazine submission period, except you don’t need to submit the full story. In fact, they don’t want that. They want a brief synopsis (100 words or less) of what the story is about without giving away the ending, and a sample scene of no more than 500 words. Think of the synopsis as more of a back-cover blurb for a book, with a sentence or two of introduction, another sentence or two for the main character and his goal for the story, and then another sentence that presents a complication (But then…) with maybe a final sentence that asks a question (Will they…?). Take a look at all of the synopses on the Black Library’s website and you’ll see what I mean. The deadline is April 10th, 2018, so get to work! It’ll be here before we know it. A sad end to a great era. The makers of “Settlers of Catan” are closing their doors. 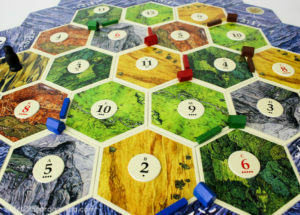 It won’t meant the end of Catan, as another company is picking up the rights to it, but it is still an ending for Mayfair Games. This hits close to home for me, as Settlers of Catan was one of the first non-traditional board games I’d gotten into. Before it, I didn’t play too many board games other than the usual suspects (Clue, Monopoly, Life, etc). I had one friend I played Axis & Allies with every now and then when we were over at his house, but after a point we shifted over to playing StarCraft or Rome: Total War together and that sort of fell by the wayside. I’m not sure why, because Axis & Allies is a lot of fun. Although, it does take awhile to set up. Much easier to just load up a video game, right? Anyway, it’s sad to see, but it does serve as a reminder that I’ve got some great board games I need to break out with friends in the coming days and weeks. I think I’ll start reviewing some of them, as well. Things like Arkham Horror and a new acquisition I haven’t even unboxed yet: Descent – Journeys in the Dark. More than just reviews of them, it’ll be more like after action reports, because my friends and I get into some stupid crap that can be pretty funny. My wife and I have been on an anime comedy kick of late. 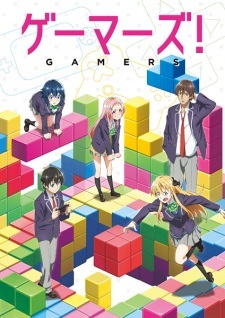 I’d like to get her into the new(er) Star Blazers anime, but she’s been in the mood for more lighthearted shows, so our newest foray has been into the Funimation dub of “GAMERS!” (The sub is available for free on Crunchyroll) a show that’s a cross between a romantic comedy and a tribute to video games and the many reasons why people love them. 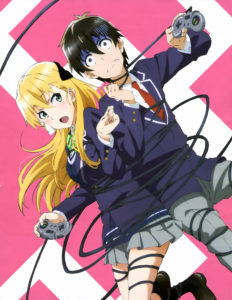 The lead protagonist is a soft-spoken, socially awkward boy named Keita and his encounter with Tendou, the school’s blonde bombshell who’s way out of his league except for one shared passion: their love of video games. Tendou secretly runs the school’s game club and invites Keita to join an elite group of high-end, tournament-winning gamers. His response leads to a chain of events that ultimately devolves into a love dodecahedron where he and all his new friends have no idea what’s going on, who’s dating who, who likes who, or what the ultimate outcome will be. One of the funniest parts about it is how clueless Keita is regarding Tendou’s feelings. She’s head-over-heels for him, but he can’t see it, and she worries she’s out of his league. We’re only six episodes into a twelve episode season, but already it’s one of my favorite shows from last year. And the video game references used range anywhere from old school RPGs and platformers to fairly recent entries like Player Unknown’s Battlegrounds. That alone got me interested, but the strange relationship web is what’s keeping our interest. The characters are funny, the situations are even funnier, and we’re loving every minute of it. Give it a try if you’ve got some time to kill! I haven’t seen the Japanese version yet, but the English version has been spot on. Funimation has been putting out a lot of great stuff over the last few years, and we’re glad to see that trend continue. 4.75/5.0. Our hero, the badass warrior known as BlackHearted Ashok is the strongest of a small order of battle-hardened, magically enhanced warrior monks in a fantasy world that takes a lot of cues from India, China, and even the United States gets an appreciative nod when the concept of freedom and the bearing of arms is brought in rather early, and only reinforced with additional characters much later in the story. He has come a long way by the time the book opens, having spent two decades fighting in service of the law that rules over all that’s left of mankind, or most of what’s left (We quickly learn that some resist and that some are above the law). He’s at the top of his profession, a fantasy equivalent of the judges in the Judge Dredd series. He wields an ancient and rare Ancestor Blade, a sentient weapon that will only respond to its wielder and no other. After several scenes and flashbacks of Ashok’s life and deeds, he learns of a grave truth about his heritage that will change everything, for himself, for his Ancestor Blade, and for the nation that he serves. Along the way we meet several very interesting characters, from a brother warrior whose family lost its own Ancestor Blade to a house warrior-turned-prison-warden who takes a keen interest in besting Ashok to restore his fallen reputation, to a librarian woman in the capital city’s famed archives. If anything, I wished the book had spent more time following some of these side characters more, as many of the story threads involving them weren’t pursued fully. Now, I know that’s because there’s going to be a book two, but still! No, that silly complaint aside, the book was very well paced and did a good job of bouncing back and forth between the cast at appropriate points. We also get some glimpses into the main villain(s) every now and then, and I can’t wait for both to get theirs. 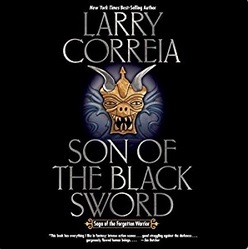 If you own the Kindle version of Son of the Black Sword, it greatly cuts down on the price of the Audiobook. That is what I did. If you’d like to purchase it or other books from Amazon, I’d appreciate if you used the affiliate link here or in the image above: Son of the Black Sword. It helps keep the site running, and it keeps me stocked in audiobooks for more reviews. It is appreciated! Publisher of Sha’Daa Series Radio Interview! Just a quick post today. Michael Hanson, creator and editor of the Sha’Daa series of dark fantasy / horror short story anthologies is going to be interviewed on a talk radio station out of New Jersey tomorrow at 7:35 AM, EST. He’ll be interviewed by Bert Baron of WCTC 1450. Never listened to the station, but I don’t live in New Jersey so that might explain why! I’ll be tuning in tomorrow. It’ll be interesting to hear what Mr. Hanson has to say about the upcoming Sha’Daa anthology coming out at the end of March. 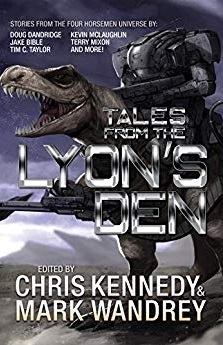 My short story “Bag of Tricks” will be one of the stories featured in there, along with a couple others I have read from good friends of mine. Here’s to more successes in the realm of space exploration and commerce!